Before: Patient needs Upper Arch Rehabilitation. 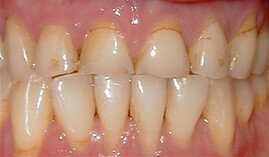 Presents with Upper Anterior teeth that are stained, incisal edges (tooth edge) are worn down and chipped, and gumline recession is present. 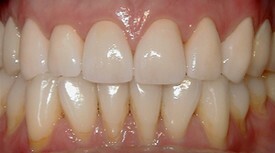 After: Smile restored with placement of 8 Upper All Porcelain Crowns (Caps). Gumline and incisal edges are now uniform. 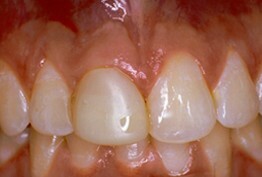 Patient now has longer, better shaped teeth to enhance the smile line and aid in chewing/biting function. Before: Patient unhappy with six Upper Anterior teeth. 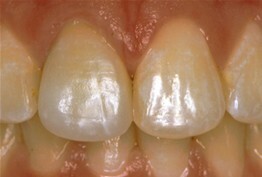 The edges are uneven, the gumline is uneven on the two central incisors, and the color/shade is not uniform. The two lateral incisor teeth have been previously restored and are poorly shaped. After: Smile restored with 6 Upper Anterior Crowns that are properly shaped, gumline is uniform, and color/shade is the same for all 6 incisor teeth.